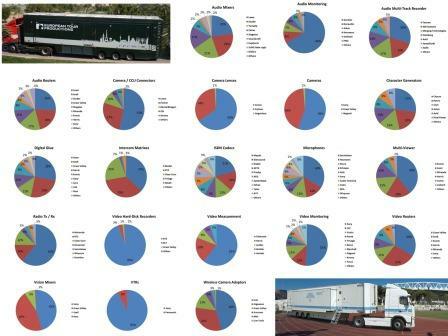 In addition to the 147 HD OBVan entries from 85 European companies we now have detailed descriptions of 25 HD OBVans from companies covering Argentina, Australia, Brazil, Canada, Israel, Kazakhstan, Qatar, South Africa, Tunesia, Turkey, UAE and USA. Our catalougues will be continously updated and expanded. The initiative was based on a) the analog transmission standards (HD-MAC, D2-MAC for standard definition), b) Test production & transmission during the Olympic Games 1992 in Albertville and Barcelona and c) numerous productions in Europe, organized by the European Consortium VISION 1250 with production facilities provided mainly by Thomson and BTS. Under the High Patronage of H.S.H. Prince Albert II of Monaco and under the Patronage of the International Olympic Committee, SPORTELMonaco is the world’s only international Convention which gathers in Monaco from 11th – 14th October the main actors and personalities from the world of Sport and Television within its diverse program. The International Sports Program Market for Television and New Media is universally recognized as the one indispensable, must-attend international Market for companies involved with any aspect of sports programming and sports content across all distribution platforms. Every October, high-level sports executives gather for 4 days of networking, deal-making, learning about new industry trends, forging new alliances… In 2009, 2 247 participants representing 938 companies from 68 countries attended SPORTELMonaco. At SPORTEL in Monaco our 3D booklet is available. The booklet covers recent 3D productions like football, ice hockey, rugby and tennis and gives a comprehensive overview of available 3D production trucks as well as a brief description of state-of-the-art 3D production equipment.